I was at work a few weeks ago and my research division's general manager was chatting with a group of researchers about a talk he gave on cameras and optics to his son's primary school class, a group of 9-year-olds. During the question time at the end of his talk, one of the kids asked him, "How does a lens bend light?" My GM told us that he was unprepared for this question, and in the few seconds he had to think he couldn't come up with a good way to explain it that would make sense to a 9-year-old child. Everyone else in the conversation nodded sagely, murmuring things like, "Yeah, tough question," and so on. What I was thinking was, "What an absolutely golden opportunity!" 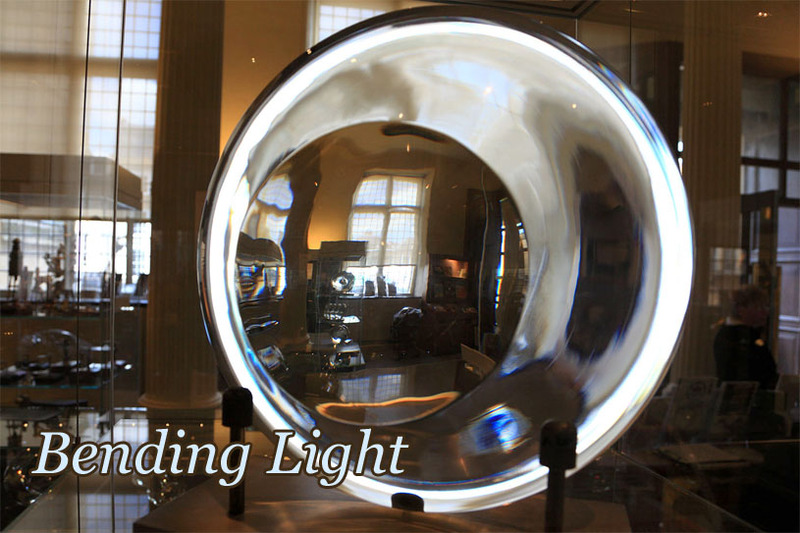 I must admit that I didn't come up with something immediately, but my mind was ticking over, and within about half an hour I had the essence of an idea for a way to do exactly that: explain how a lens bends light in terms a 9-year-old can understand. Figure 1. Light bending through a lens and a prism. One of my convictions is that it's possible to explain anything to anyone who is at least willing to listen. You may need to use very simple analogies, gloss over some gory details, and what have you, but you should be able to get the basic point across. I think at some level that's how my own mind works when trying to understand something complicated. So, lenses. The basic thing to understand about lenses is that they bend light. This is the principle behind their use in all sorts of devices, such as cameras, telescopes, microscopes, binoculars, magnifying glasses, and eyeglasses, which I think covers most of the applications people would immediately think of. These devices all gather light and allow you to look at objects in particular ways that you can't do otherwise. Lenses are also used in things like movie projectors, torches (flashlights for the Americans), car headlights, and lighthouses, to project beams of light. And the other important place you can find lenses is in eyes; you're reading this now through lenses in the front of your own eyeballs (unless you're using a screen reader). If you examine some lenses, one thing you can notice pretty quickly is that they are all transparent, so that they let light pass through them. The next thing you might notice is that they all have curved surfaces. Here is an important hint about how lenses work. Figure 2. Light entering glass. So we've moved from complicated curved shapes to simpler shapes with flat surfaces that still bend light. We can simplify things one step more by considering only one of the two flat surfaces, either where the light goes from air into the glass, or where the light goes from inside the glass back out into the air. If you draw that, you get the diagram shown in Figure 2. So what's going on here? Why does the light bend like that? Why doesn't it just go through in a straight line? This might seem a bit surprising, but the answer depends on how fast the light travels. How fast is that? When you turn on a light switch in a dark room, the light hits your eyes right away. It's so fast that you don't notice any delay at all. Is it instantaneous? No, it's just very very fast. Light travels at a speed of close to 300,000 kilometres per second (km/s). That's fast enough to go around the world seven and a half times in one second (if it could curve around). That's pretty darn fast. Only light doesn't always go that fast. When it goes through something, like glass or water, it slows down a bit. It's like when you are walking quickly and then suddenly there's a crowd of people in the way. You need to slow down to push your way in between them. Or when you're running down the sand on the beach and you enter the water, you have to slow down as it takes more work to move your legs through the water. It's a similar thing with light. As it moves through a material, it kind of has to push its way through the atoms. The more closely packed the atoms are, the more it has to push and the more it slows down, roughly speaking. In fact, light only travels at its full speed when there are no atoms at all, in what we call a complete vacuum. The closest thing to a complete vacuum that we normally think about is outer space, though this still has a few atoms floating around. The atoms in gases are pretty far apart. Light slows down only a very tiny bit in air; it's almost not even worth mentioning. But in glass, light slows down substantially, from 300,000 km/s to something under 200,000 km/s. The exact amount depends on the type of glass. So when light enters a piece of glass (from air), it slows down suddenly. It's just like running down the beach, then hitting the water and slowing down as you have to struggle to move your legs through the water. Okay, so what's this got to do with the light bending? Imagine you're running down the beach with a group of friends, holding hands or with your arms linked together. You run side by side and at the same speed, so you form a nice straight line sweeping across the sand, straight towards the water. Now everyone in the line hits the water at the same time, and everyone suddenly has to slow down. That's fine, everyone slows down at the same time, so your entire line of friends, considered as a single object, just slows down, and everyone stays in line. This is just like what happens when light hits a piece of glass straight on. It just slows down. Figure 3. Line of people bending as they enter water. Now imagine your line of friends is running across the beach at an angle to the water. Now people on one end of the line are going to hit the water before people in the middle, who hit before the people at the other end. When the first person hits the water, they slow down, but everybody else is still running at full speed. If you've ever played crack the whip, you'll know what's about to happen. When someone at one end of the line slows down, everyone else begins to whip around in a curve. 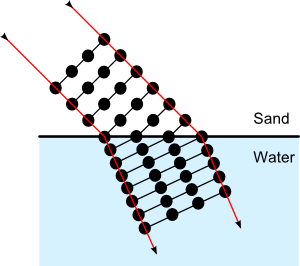 The result is that as successive people in the line enter the water, they end up running in a different direction to the direction they were running on the sand. So if a line of people holding hands runs in one direction and hits something that makes everyone in the line slow down, and they hit it at an angle, then everyone ends up running in a different direction. The path of motion is bent. And that's pretty much what happens with a beam of light when it enters a piece of glass at an angle. The light is slowed down, and it slows down on one side of the beam before the other side, so the beam does a "crack the whip" and curves around, bending at the boundary. The same thing happens in reverse when light goes from the glass back into the air. It's like running out of the water with your line of friends. If one end of the line emerges first, the people at that end can run faster than everyone else, so they swing around and the line ends up running on the sand in a different direction to what it was moving in the water. There's one big difference between light entering glass and leaving glass though. 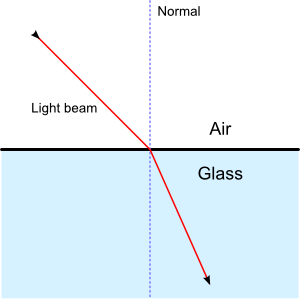 Going in, the light is slowed down and always ends up bent towards what we call the "normal", which is simply a line at right angles to the air-glass boundary, as shown in the diagram. That's fine. No matter what angle you come in at, as long as it isn't directly along the normal, you can always bend a little bit more towards the normal. But imagine what happens if you and your friends are moving in a line out of the water at a a really big angle to the normal. The person on the end of the line steps out onto the sand first and starts running faster. If the line was at a small angle to the normal, the second person and third person and so on would emerge from the water soon after, and your line of people would bend as explained already. But now the second person doesn't emerge from the water for quite some time, and the person on the end, now running, has time to swing right around and enter the water again before the second person has had time to leave the water. The result in terms of an actual line of people is a big mess, but if you imagine the people can magically move right through each other, what you end up with is everyone moving back into the water, having kind of "bounced" off the sand, instead of emerging out onto the sand. And this is pretty much what happens to a beam of light as well, if it's heading from the glass towards the air at a big angle to the normal. It bounces off the surface and goes back into the glass. We call this total internal reflection. 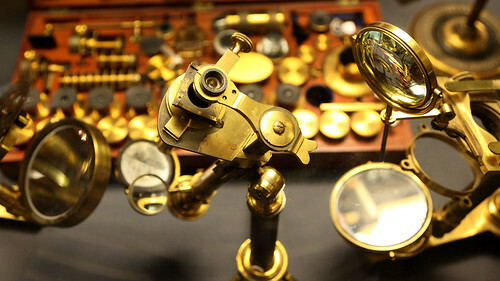 Lenses and microscope. Museum of the History of Science, Oxford University. Now of course a beam of light isn't made up of lines of tiny people with their hands held together. But mathematically speaking, the changes in speed as light travels in different materials does cause exactly that "crack the whip" effect, causing light to bend when it enters or leaves glass. It also causes the total internal reflection effect. What's more, if you use the "crack the whip" analogy, and you calculate the geometry mathematics based on how fast the light moves in the different materials, you get exactly the angles that the light beam will travel in each case. Using this analogy actually gets you the right answer. As an analogy goes, that's pretty good. To finish off, let's return to the difference between lenses and prisms. I started talking about prisms because they have flat surfaces and it's easier to see what's going on when light enters a flat surface. All the light that hits a prism from the same direction hits a surface at the same angle, so the prism bends it all in the same direction. The result is that if you look through a prism, all the beams of light come out doing pretty much the same thing they were doing when they went in, just in a different direction. So a prism can bend light, but if you look through one it doesn't change the apparent size of what you're looking at. 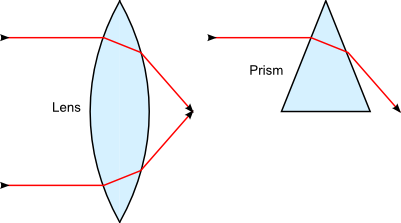 Unlike a prism, a lens has a curved surface. So even if all the light comes in from the same direction, it hits the glass at different angles, which means it gets bent by different amounts. So the light coming out the other side of a lens is not just bent, it's kind of squashed, or enlarged. What this means is that when you look through a lens, it's as though the light is coming from an object that is closer to (or further away from) your eye than it really is. In other words, the object looks bigger (or smaller). Which is exactly what you want in a telescope, microscope, binoculars, and so on. I've become aware over the years that some people's minds don't seem to work like this. Several times at work over the past few years I've been discussing something scientific, or watching a presentation of something, and the speaker in question would say something like, "Let me explain this..." I'd gleefully think they were about to show some slides with diagrams or draw some sketches on the whiteboard to explain the concept, but then my hopes would be dashed when they started showing or writing down equations. I struggle through the equations and extract some meaning and understanding from them, and then I always think, "Why didn't the speaker just draw a diagram like so... Then it would be much easier to understand!" At least, this is the case for old fashioned incandescent light bulbs. Fluorescent lights often take a second or two to warm up before they start working, but this time is related to the mechanism of turning the light on, not to how fast the light travels to your eyes. This is a simplified explanation suitable for 9-year-olds. Of course 9-year-olds know about atoms. You can bet they would if I was teaching them. Last Modified: Sunday, 30 March 2014; 00:18:24 PST.